In Spring 2010, a couple of years before her death, my mother's memoir was published. At the time my research caught a Clearwater, Florida press agent posting dozens of glowing 5-star shill reviews on Amazon.com for my mother's book and scores of other authors she represented. That turned into Scamazon, a three-part story published by the (now-defunct) Cincinnati Beacon (Part I, Part II, Part III) that was picked up by other media outlets in the US (click here, here, and here) and France (click here). The Clearwater publicist's Amazon account was deleted and the Public Relations Society of America issued a two-page ethics statement. The Amazon profile of "Avid NY Reader" includes 17 other glowing five-star book reviews. 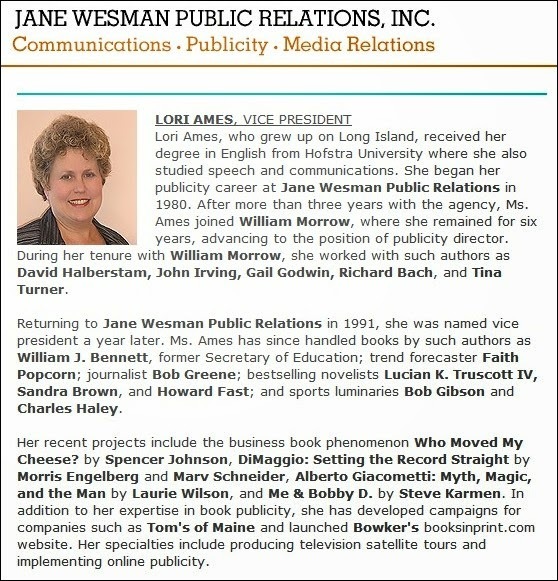 Via Internet searches, I connected Lori Ames, the Long Island publicist representing my father's book, to all of the reviews. Subject: Re: media inquiry re: Amazon reviewer "Avid NY Reader"
As you have already surmised, I am Avid NY Reader. In the last 7 years I have posted 20 reviews on Amazon. 17 for books by clients or people I know (which averages out to 2.5 reviews a year; a very small percentage of books to which I have any connection). 3 for books or products I've purchased. I have also purchased thousands of dollars of merchandise through Amazon for my home and my business for which have not posted reviews. I have always tried to be responsive and professional regarding your inquiries. If you are going to publicly take me to task for posting a review about your father's book, then you needn't direct any additional queries to my attention. Hope all is well with you and Karen. I'll ask Amazon to comment and will report the results.